Raise your arms and jump for the ledge. Us brainy bipeds are strange creatures. Put us in front of a door and we'll open it. Stick some buttons on a wall and we'll press them. Put a 2x4 holding a train cart and we'll remove it and watch it crash through the wall. 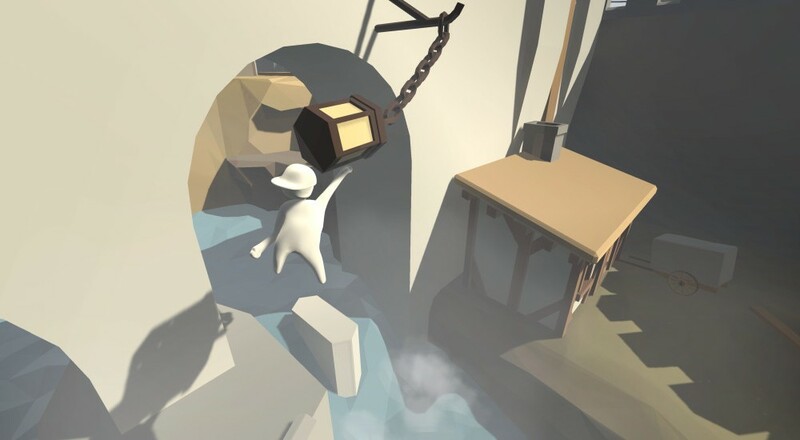 We're a mischievous sort, and that sense of reckless playfulness is exactly what Human: Fall Flat is trying to capture. Human: Fall Flat from No Brake Games is a third person physics puzzle and sandbox game that mixes realism with the awkwardness of realistic motion. It's a fair comparison to say it shares roots with Octodad, as both involve controlling an awkward character as they attempt to do ordinary things. In Human, you control a person who can jump, raise each arm independently, and grab things with either hand. By mixing up those motions you'll solve puzzles, break walls, climb mountains, fling wrecking balls, and toss TVs off cliffs. It's two parts non-linear puzzle solving and one part creativity, just the right mix for a quirky, self-aware physics game. Co-op in Human: Fall Flat is a touch limited but lots of fun. You'll need two gamepads for splitscreen to work. Not one gamepad and a keyboard, two gamepads. Plug them in and couch co-op for two can begin. The amount of puzzle solving you actually get done decreases exponentially when adding a second human. One person throws a couch through the window, the other tries to climb up the side of a rock, and suddenly both of you are just goofing off. Not that this is a bad thing, just, you know, fair warning. Human: Fall Flat releases for PC via Steam July 22 and will support two player local co-op. Online and non-splitscreen options are being explored by the developer, but don't take that as a confirmation either feature is on the way. Page created in 1.1614 seconds.